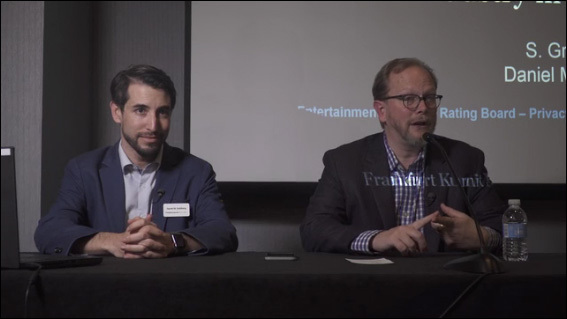 Gregory Boyd and Daniel M. Goldberg of Frankfurt Kurnit, in partnership with the Entertainment Software Rating Board (ESRB), present a fascinating CLE course on the most pressing privacy issues related to video games and online advertising. Intended for lawyers and laypeople, the course will explain the impact of the GDPR on online advertising as well as projections of the impact of the California Consumer Privacy Act which goes hand-in-hand with the increased focus of regulators, consumer advocates, the media and academia on topics such as youth audiences and geo-location. Gregory Boyd is a partner and Co-Chair of the Interactive Entertainment Group at Frankfurt Kurnit. Mr. Boyd focuses on high technology companies in advertising, public relations, and the video game industry. He has extensive experience negotiating and drafting all of the operational agreements for these businesses, including software (SaaS), licensing, employment, and development agreements — for video games and other digital media across all platforms. The International Association of Privacy Professionals (IAPP) has certified Mr. Boyd as both a Privacy Program Manager (CIPM) and Privacy Technologist (CIPT). Mr. Boyd also creates and manages privacy programs, including privacy policies, incident response, and data classification projects. He has experience with all legal documents associated with the ongoing operations of video game publishers, online video games, software development, social networks, branded entertainment, marketing communications, and media outlets. He has advised high technology media companies on intellectual property portfolio licensing, strategic development, valuation, litigation, and registration of intellectual property. Mr. Boyd is co-author of Video Game Law: Everything You Need To Know About Legal and Business Issues in the Game Industry (Taylor & Francis/CRC Press, Fall 2018), his second book-length discussion of the industry. He is also co-author and editor of the prior popular textbook Business and Legal Primer for Game Development (Charles River Media) and wrote the chapter, "Intellectual Property in the Video Game Industry" in Mastering the Game: Business and Legal Issues for Video Game Developers (World Intellectual Property Organization). He is a founding member and past Board member of the Video Game Bar Association and a member of the Advisory Board for the NYU Game Center Incubator. He is a frequent speaker at international media conferences and educational institutions, and he taught a seminar on advanced topics in intellectual property for six years at New York Law School. Mr. Boyd is often quoted on technology and privacy issues in Mashable, Gamasutra, Edge-Online, CNN, Fortune, Forbes, and the New York Law Journal. The Legal 500 has praised Mr. Boyd for his work with media and technology companies. Mr. Boyd is admitted to practice law in New York and is a registered patent attorney with the USPTO. Daniel M. Goldberg is counsel to the Privacy & Data Security Group, and a co-chair of the LA chapter of the International Association of Privacy Professionals. Mr. Goldberg represents clients in a broad spectrum of privacy and data security matters. He structures and negotiates complex agreements involving the collection, use, storage, and monetization of confidential data. He helps clients develop privacy and data security programs and policies, conduct privacy due diligence in connection with fundraising and acquisitions, and respond to data breaches and regulatory inquiries. He also works with organizations to address cross-border data transfers, the European General Data Protection Regulation (GDPR), the Vermont Data Broker law, and the new California Consumer Privacy Act (CCPA) effective January 2020. Mr. Goldberg has special expertise in the advertising, media, entertainment, and interactive industries. He counsels advertisers, publishers, and technology providers on ad-tech issues, including programmatic, data onboarding, API calls, and SDK integration. He advises brands and media companies on legal concerns relating to mobile apps, smart home devices, and wearables, such as collection and use of children’s information and health data. He works with video game developers and platform operators to address industry-specific concerns, such as player account linking, augmented reality, and virtual reality. Mr. Goldberg is a frequent speaker on chatbots, entrepreneurship, emerging technologies, and privacy issues. He has guest lectured at the University of Southern California and spoken at programs sponsored by the National Advertising Division, the Association of National Advertisers, the Brand Activation Association, the American Bar Association, Digital Content Next, Children’s Advertising Review Unit, Practicing Law Institute, Beverly Hills Bar Association, Association of Media & Entertainment Counsel, International Association of Privacy Professionals, and Social Media Week. He has written articles published by LA Lawyer Magazine, Computer Law Reporter, and ISSA Journal, and is a contributor to the Media Law Resource Center. He is also a contributor to the Firm’s Focus on the Data and Advertising Law Updates blogs. Prior to joining Frankfurt Kurnit, Mr. Goldberg worked at BakerHostetler and Bryan Cave, where he frequently appeared in federal and state court litigation. He also helped launch a technology startup, which was acquired by a multi-national company in 2016. Mr. Goldberg combines his litigation roots, technical understanding of advertising technology, and insider’s perspective on the technology sector to deliver cost-efficient representation for his clients. Mr. Goldberg is a graduate of University of California Los Angeles and University of Southern California School of Law. He is certified as an Information Privacy Professional (CIPP/US) and admitted to practice in California.